Yesterday I left you with a promise to follow-up on the Round Robin tale. So here goes. As I said, the neighborhood birds are eating well… so well that they are getting fat. Anybody who says that animals only eat what they need is full of it. And you know what it is. Birds, for example, are little pigs. Sometimes aggressive little pigs. We have a Red Winged Blackbird that will commandeer an entire feeder, chasing off all comers, including White-winged Doves that are more than twice his size. He doesn’t care. He’s a bully. Nobody is allowed near that feeder until he’s stuffed. Curiously, he even chased off a Golden Shafted Flicker, and that woodpecker is easily twice his size with a beak strong enough to hammer holes in an oak tree. Believe me, that’s no easy task. Turns out, however, Mr. Flicker is a scaredy-cat. The only one that gets away with sharing the feeder is one of the smallest birds we have… an Eastern Black-capped Chickadee. I’m guessing it’s because he’s so small, he can sneak in on the opposite side of the feeder without attracting the Red-wing’s attention. 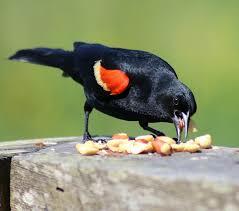 He’ll grab a seed and be gone before the blackbird knows he’s even there. The blackbird has a fraidy-cat side too, though. Let a human step into the yard and he’s gone faster than you can say, “lollapalooza.” You might say people are his Achilles’ heel. Or maybe he just doesn’t like us. Who knows? But I digress. Anyway, on to cause and effect number one. Normally, the neighborhood birds breed and raise a brood twice a year. Once in first spring (that’s the normal one) and once in second spring (that would be in late September. We do get winter in South-central Texas, but it only lasts a couple of days. The rest is spring and summer. They tell me we have fall here, but I’ll be damned if I’ve ever seen it. Back to the birds. This year, with all the folks providing them with an abundance of good eats, the horny little buggers have had two broods so far, and they seem to be working on a third. This causes a population explosion, which, of course, increases bird seed sales at the local Walmart. If the birds weren’t so much fun to watch, I could save a fortune. Okay, maybe not a fortune, but at least enough to go buy that nice 10” compound miter saw Harbor Freight keeps enticing me with lower and lower prices. I don’t know where I’d put it… the shop is pretty darn full right now, but it would simplify a lot of little jobs. I digress again… dammit. Maybe I have ADD… Ooooh! Squirrel! Hey… don’t tell me I’m the only one! I’ve seen what some of you out there post. Speaking of squirrels, we are now attracting those… about four of them. I’m pretty sure they’ve taken out ads in the squirrel network. Not only that, they’re losing their fear of me. Now they just climb up on the fence or the pergola and stare at me when I try to scare them off. On the other hand, they might just be too full to move. This brings me to the second cause and effect. I was sitting on the back porch enjoying a relatively cool afternoon (I say relatively because the temperature was hovering around 90° F rather than the 100+° mark where it had been for the past week). The birds were ignoring me as usual, happily nibbling away at the column of sunflower seeds in the feeders. Dumb Dora (a White-winged dove so named because her porch light burns only at about ten watts) waddled up to get a drink. When I say waddled, I’m not joking or being disparaging (well, maybe just a little). Dora is so fat her belly almost drags on the ground. Anyway, she hops up on the small fountain to my left and proceeds to leisurely drink her fill while I sit and watch. She’s just about to head back to the feeder when there is a sudden flash of gray, the air next to the fountain is filled with a puff of downy feathers, and Dora is GONE! I mean gone gone. Yep, number two… cause: fat doves; effect: hungry hawks; result: dinner for one. Hey, hawks have to eat too. Old Mr. Goshawk found fat pickin’s, literally. At least he did that day. This event, however, seemed to have shocked the dove population back into reality from the state of Nirvana to which they had succumbed. They posted sentries in the tree tops and roofs of nearby houses. I never hear a call of warning, but all of a sudden, whoosh! The whole flock takes off at top speed. Sure enough, the hawk is hot on their tails. The doves have developed a new tactic that seems to be working. While they take off en masse, they scatter to the four winds as soon as they’ve gained altitude. 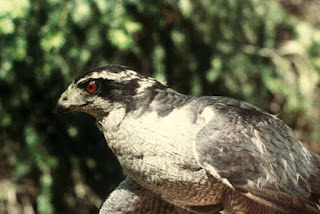 This confuses Mr. Goshawk… by the time he gets around to fixing on a target, they’ve all pretty much disappeared. I kind of feel sorry for the old bird, though. He spends a ton of energy chasing doves grown fat on easy pickings while he goes hungry. All the birds are gone for now, and I see a furry reddish banner waving above the feeder. Maybe Mr. Hawk should consider hunting squirrels. So, most of you know I put out bird feeders. Apparently this has triggered something of a competition among my neighbors. Yep, we’ve given our feathered friends a veritable cornucopia of choice. The peeps can now do a round robin, stopping off at Bob’s Buffet, chow down at Charlie’s café, or sate their appetites at Brad’s Borgasmord (yeah, I know how to spell the real word, but it doesn’t roll of the tongue as neatly… besides there was this commercial back in the 70’s… oh never mind.). Charlie was actually the second to start blowing his allowance on bird seed. His wife complained that all the birds had deserted their back yard and she had “seen them flocking to Brad’s back yard.” So, Charlie hauled out his table saw, found his hammer and some nails, and proceeded to build a backyard bird feeder, which he hung from the low hanging limb on his oak tree in the back. Now Charlie’s wife could have gone to the store to buy the bird seed, but no, the bag was “too heavy.” Instead she dispatched Charlie to get the chore done, which is a little odd since Charlie has a pace maker and is about ten years his wife’s senior. Oh well, it gets him out of the house… or should I say the garage where he spends most of his time tinkering with things. Like I should talk. Anyway, Charlie climbs in his 1972 Chevy pickup truck, puts in in first, and crawls out of the neighborhood, headed for the Walmart. The Walmart is less than two miles away. Charlie’s gone for two hours. Some might have wondered if his pace maker gave out while carrying that big bag of bird seed out to his truck in a hundred, sunbaked degree weather, but I knew better. I’ve followed Charlie’s truck out of the neighborhood a couple of times. I don’t think it goes over five miles an hour, so it’s going to take some time. Right? Finally, he gets back with the bird food and in a scant two hours more, he’s got the feeder loaded. How do I know all this? Well, Charlie stopped by for a quick visit a couple of days later and told me all about it. Two and a half hours later he had exhausted all the things he wanted to talk about and apparently himself. He announced that he thought he’d head home for a nap. Bingo Bob, on the other hand was a late comer to the competition. He showed up about two weeks later as I was doing a little work in my garage. “Whatcha up to?” he asked. I didn’t jump this time… I saw him coming. “About five foot ten,” I replied. “Well, I used to be six feet tall, but age has shrunk me about two inches,” I explained. While Bob chattered on, I continued to work. Finally I had to switch on my table saw to cut a couple of small boards. Even though I held up a finger to let him know he needed to wait one, he kept right on flapping his lips. I could see them moving, but the saw drowned out whatever he was saying, Not that it mattered much. A lot of times Bob just talks to hear himself talk. I switched off the saw. “…something?” Bob finished the question. Anyway, long story short (yeah, I know, too late for that), Bob went and got a couple of bird feeders and a big bag of bird seed. So now the competition was on… but I have a secret weapon… two small fountains and one big one. The birds come for the food and stay for the water. 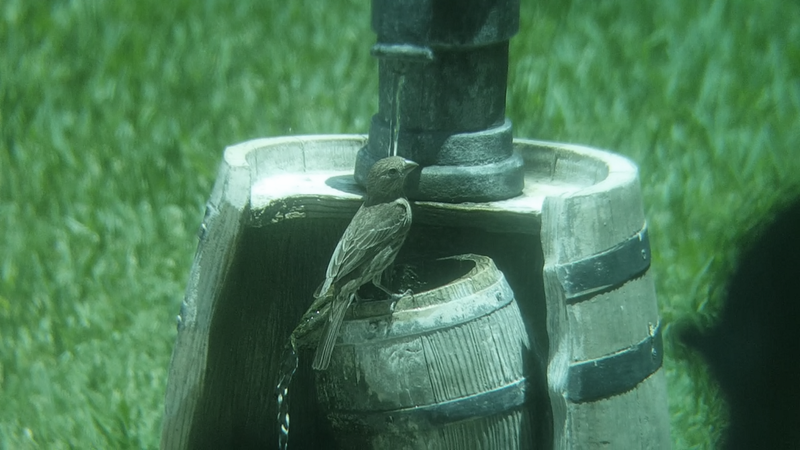 Charlie’s wife got a bird bath, but it was from one of those dollar stores and it was made out of plastic. Plastic doesn’t do well under the Texas sun, so in about two weeks, the basin had cracked and it only holds water for about a half an hour… and Charlie got tired of refilling it so often. Now it just sits there. Bob bought a fancy pedestal bird bath with a big glass bowl that sits on the top… or did… right until we got that last storm that put down gusts of 59+ mph. It doesn’t sit on top anymore… it lays on the ground… in about five hundred pieces. One of these day’s Bob will clean it up. Well, it’s been a pretty wet spring. My little Garden of Eden had turned into the jungle of Borneo. Yep… vegetation was taking over my outdoor living space. If I let it go much longer, I won’t be able to get out the back door and that will just tick off the feathered freeloaders who depend on feeders full of sunflower seeds. Can’t have that. It was particularly beautiful out this morning… a balmy 70-degrees with clear skies and the sun just breaking the eastern horizon. Yep, it was perfect. Time to do some trimming. I fetched my pruners and started cutting a path to my front yard. I was starting there, because it’s the first to get the sun. If I waited until nine, it would cook me, and I wasn’t up for that. 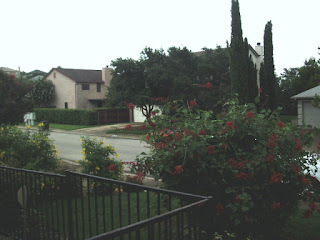 I had just finished cutting the esperanza where it was overhanging the driveway, threatening to choke access to the garage, and had moved on to the rose bushes that are starting to look more like rose trees when I heard Bob hail me from the sidewalk. “Trimming your bushes?” he called cheerily. I kept on clipping, hoping Bob would keep on walking. Yeah, I know, fat chance, right? Now he was right beside me and I hadn’t invited him, but then Bob doesn’t need an invitation. Bob’s like an annoying gnat. No matter what you do, he keeps showing up. I sometimes wish they made people repellant. That probably wouldn’t work either. He’s developed resistance. When I didn’t answer right away (I was trying to think of a smartass response that I hadn’t used before), he persisted. Sometimes I wonder about Bob… on second thought, I wonder about Bob most of the time. I thought about giving him the phone number to the Joint Base San Antonio (it used to be called Brooks Army Medical Center or BAMC – pronounced BAM- see) contracting office, but then I figured Bob would actually call them and I’d get a visit from the Army Inspector General’s office, so I didn’t. I just looked askance at him. “So, who was it?” he demanded. I’m sure Bob would have demanded more details, but I was done pruning my growth industry. Besides, the organic material recycling bin was full and the city is picking up today. I just left him there, goggle-eyed. He has the number and I figure our civil servants could use a laugh.